Devotion to caramel apples, and a storied hometown festival. Eventually, we turned down Route 16 from Watertown Square, where we were living at the time, and followed it up into Nonantum, a Village Of Newton, as the signs say. There was the unmistakable shine of neon above an auto-repair place and the air smelled of fried foods. We were home. For 76 years, the St. Mary of Carmen Society of Newton has put on a festival in Nonantum. The society was founded in 1935 by a group of 11 Italian-Americans who were trying to raise money to assist newly arrived immigrants from the old country. (Our Lady of Carmen is a derivative of Our Lady of Mount Carmel, an honorific given to the mother of Jesus and associated with the Carmelite religious order. 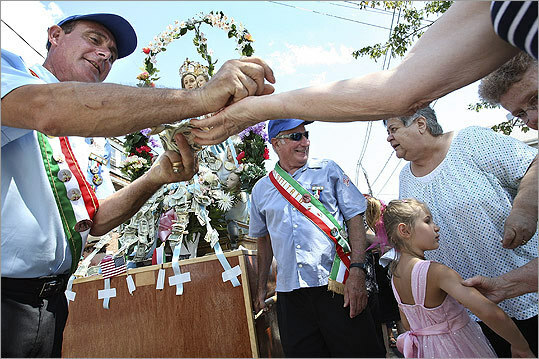 Devotion to Our Lady of Mount Carmel was particularly strong among Italian immigrants to this country; in Worcester, when I was growing up, Our Lady of Mount Carmel Church off Shrewsbury Street was regularly referred to as “the Italian church.”) It began as a religious festival, and it still culminates with a procession from the site of the festival – Pellegrini Park on Hawthorn Street – to Our Lady Help of Christians Church on Washington Street. A statue of Mary is carried, to which people affix dollar bills; the money helps fund college scholarships and community events, including the festival itself. Better than that, though, the festival is a purely neighborhood event, even drawing people who don’t live in the neighborhood anymore, many of whom call it simply the Festa. Nonantum is one of the last old-line sections left in Newton; many people still refer to the area as “The Lake,” after Silver Lake, a pond off Adams Street that got filled in and built upon in the first half of the 20th century. The Lake has its own language, an amalgam of Italian and Romany, the latter of which is attributed to local young men who picked it up when they went off to work at (ironically enough) traveling carnivals. If you happen by the Festa and hear someone referred to as a “divia mush,” you’d be wise to keep your distance. “Mush” is the all-purpose word for a man. “Divia” may mean he’s spent a little too much time in the beer pen. From the outside, it is a carnival in the most generic sense. There are rides, though fewer than there used to be, and a midway. But the Italian sausages are more than special, and so is the eavesdropping. You will hear Lake-speak, of course, and the old people in the folding chairs will speak Italian in a dozen different dialects. Three years after we stopped for that caramel apple, we moved to Newton, north of the Turnpike, not far from The Lake. We moved into a history that felt very much like home.